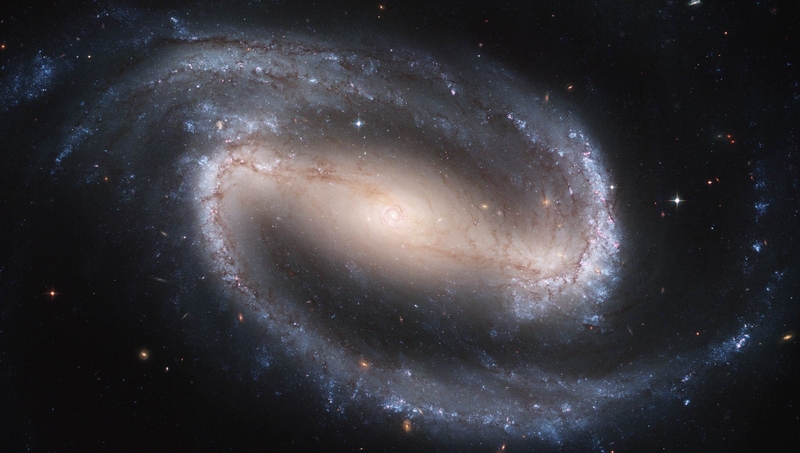 Galaxies are gravitationally bound systems of stars, gas, dust and dark matter, containing anything from several million to over one hundred trillions stars, and ranging from a few thousand to over one million light-years across. They have often been poetically referred to as ‘star cities’ or ‘island universes’, with the word galaxy deriving from the Greek word for ‘milky’ – a reference to the name of our own home galaxy, the Milky Way. Between 1922 and 1993, the astronomer Edwin Hubble‘s measurements of the distances of Cepheid variable stars in what were known at the time as ‘spiral nebulae‘, showed that even the closest of these objects are many millions of light-years beyond the boundary of our own galaxy. Hubble, therefore, proved that these ‘spiral nebulae’ were, in fact, distant galaxies, similar to our own. 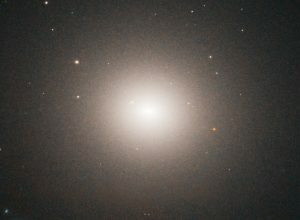 The largest known galaxy is IC 1101, a supergiant elliptical galaxy in the constellation of Virgo (the prefix IC denoting the Index Catalogue of Nebulae and Star Clusters). IC 1101 contains over 100 trillion stars and has an effective radius (the radius within which half the light is emitted) of over 200,000 light-years (approximately 65 kiloparsecs), although its farthest reaches extend over two million light-years from its centre – making it at least twenty times the diameter of the Milky Way. The majority of the galaxies visible to us are, however, categorised as ‘dwarf’ galaxies, consisting of just a few billion stars and less than one hundredth the size of the Milky Way. Visually, stars are the most obvious components of a galaxy. 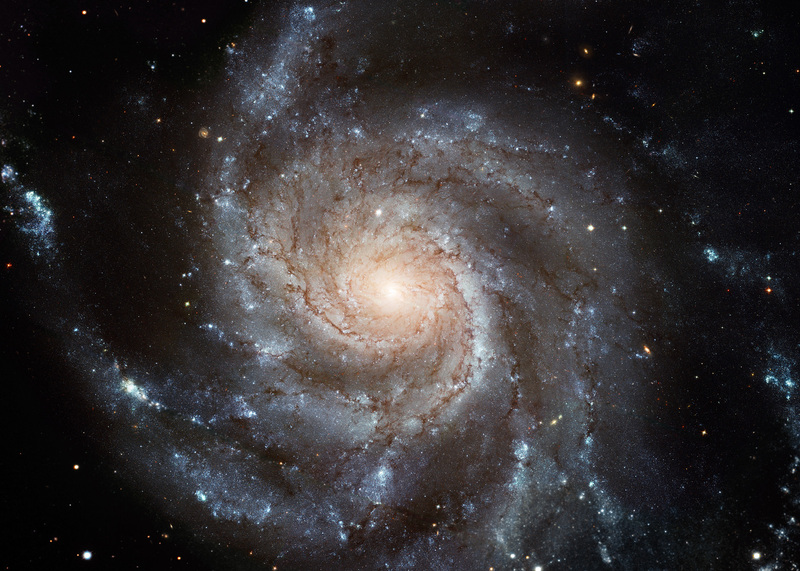 However, studies of the way in which the orbital rotational velocities of stars vary with their distance from their galactic centers suggest that galaxies must contain far more mass than the total from the stars, dust and gas of which they appear to be primarily composed. 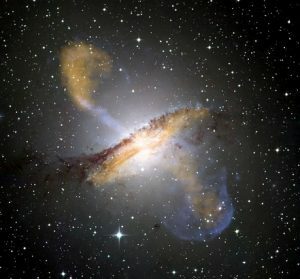 This evidence suggests that galaxies are, in fact, embedded in a spherical halo of a mysterious and invisible ‘dark matter‘, the composition of which is currently uncertain – although many candidates for this dark matter have been proposed. 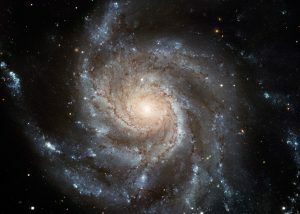 Spiral galaxies consist of a central ‘bulge’ of stars, dust and gas, which extend outwards into a number of spiral ‘arms’. 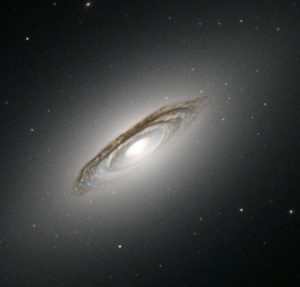 Barred spiral galaxies are similar in appearance to spiral galaxies, except that the central galactic bulge is extended to form an elongated ‘bar’ shape. 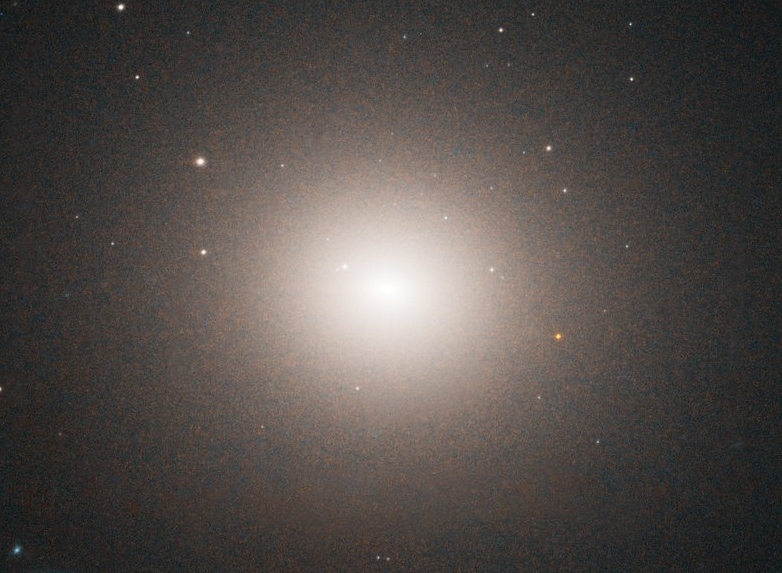 Elliptical galaxies show little internal structure, with their stars homogeneously distributed and forming an elliptical shape, as viewed from any direction. The ellipticity of such galaxies can range from roughly spherical, (classified as E0) to highly elliptical (E7). Shell galaxies are similar to elliptical galaxies, except that the stars are arranged in concentric shells. Lenticular galaxies have morphologies somewhere between elliptical and spiral galaxies. 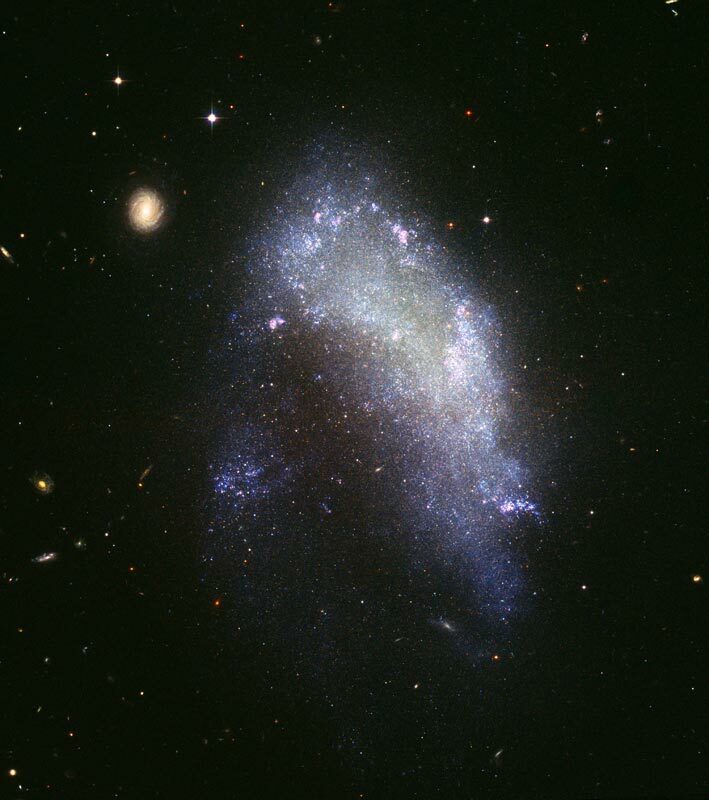 Irregular galaxies have shapes that do not easily fit into the above classifications. Interacting galaxies consist of two or more galaxies that are in the process of colliding or, in the case of ‘peculiar galaxies’, are passing close to each other such that tidal gravitational interactions distort their shape. 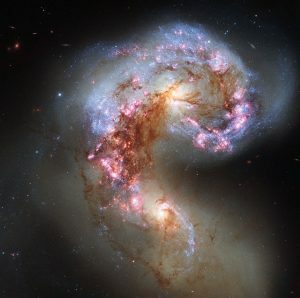 Since there are great distances between the stars in a galaxy, the stars themselves do not usually collide when galaxies pass through each other, however, such collisions can leave galaxies with highly irregular morphologies. Some galaxies posses what is known as an active galactic nucleus, emitting jets of particles above and below the plane of the galaxy at close to the speed of light. It is believed that these jets are the result of matter falling into a supermassive blackhole at the centre of the galaxy. Many non-active galaxies, such as our own Milky Way, are also suspected to harbour ‘dormant’ supermassive blackholes at their centre. Quasars are extremely distant and energetic sources of highly red-shifted electromagnetic radiation, believed to come from the active galactic nuclei of galaxies as they formed in the early universe. An active galaxy with a jet that is pointed in the direction of Earth is known as a Blazar. Galaxies are usually gravitationally bound together into galactic groups and clusters. 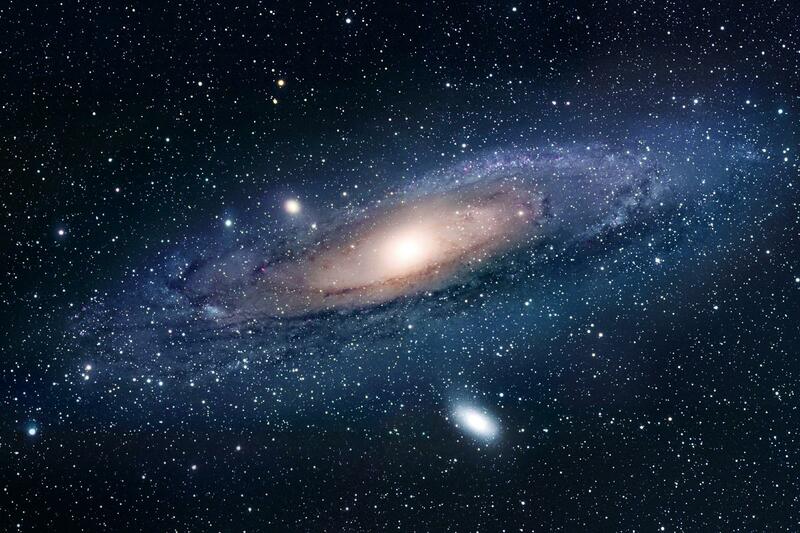 For example our own galaxy, the Milky Way, is one of the largest members of what is referred to as the ‘local group’. This consists of over 50 galaxies, most of which are categorised as dwarf galaxies, although the Andromeda galaxy is the largest member of the local group, being slightly larger than the Milky Way. On a larger scale, galactic ‘clusters’ often consist of hundreds to thousands of galaxies that are gravitationally bound together. ‘Superclusters’ consist of tens of thousands of galaxies and are spread out into what are known as ‘sheets’ and ‘filaments’ surrounding empty voids of space. At an even larger scale, however, the Universe appears to be both isotropic and homogeneous (i.e. the same in all directions).